Enough has been said about how the hoverboard is known by many different names and no one really knows what it should be called. You are reading this because you want to know about the hoverboard that everyone’s buying – a board with two wheels that uses sensors and gyroscopes to stay balanced and is operated by an electric motor. The hoverboard could be described as an electric two wheeled self-balancing personal transportation board. What a mouthful! It’s the hoverboard, simple, and you know what we are talking about. A more technically accurate definition will be – A hoverboard is an intuitive, advanced technology personal transportation product that utilizes dynamic balancing principles based on calculations of the rider’s center of gravity and moves through the use of gyroscope and acceleration sensors. There are two parts to answering the question ‘What is a hoverboard?’. First, we will look at what a hoverboard looks like, its main parts, what it basically does and its accessories. The second part is to get into the technology and ideas that go into making a hoverboard. We will start with the first part. This is what a typical hoverboard looks like, and the call-outs tell you the terms which describe its main parts. Plastic Outer Body – Usually made of high quality ABS plastic, the outer shell is hard but light. The coloour and surface is prone to scratches and damage. Wheels with built-in motors – The wheels of the hoverboard have the motors inside them, which are controlled by the foot boards near the wheel. Foot-boards – The foot boards are pressure sensitive and use electrical pressure sensors to increase and decrease the speed of the wheels. LED lights – The LED lights come one when a foot board is in use, and make the hoverboard rider more visible to other traffic at night. Remote – The typical remote has a lock and unlock option. Power switch – The power switch is used to turn on the hoverboard, to switch to learner mode and back, and to calibrate it. Charging port – The charging port is where the external charger has to be plugged in to charge the hoverboard. Charger – The charger is an important part of the hoverboard as faulty chargers can be the cause of fires in hoverboards, due to over charging. Fender protectors – The fenders that cover the wheel are the first part of the hoverboard that gets scrated or damaged. Putting some simple rubber fender protectors can keep your hoverboard looking new and unscratched for a long time. Hoverboard Carrying bag – A good quality carrying bag will allow you to easily carry the hoverboard in places where you cannot use it. Helmet – Any helmet that protects the head is a good idea, you can use a skateboarding helmet while hoverboarding. Knee and elbow guards – Knee and elbow pads are a good safety measure as they are the places most prone to injury. Battery level indicator lights – This is very important as the battery suddenly dying down might throw a rider off the hoverboard. 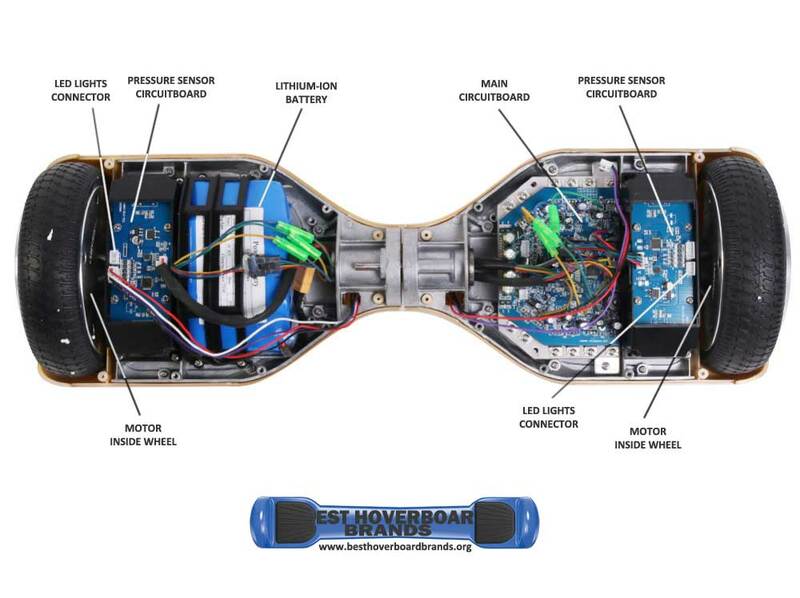 To answer the second part of ‘What is a hoverboard?’, we need to look inside the hoverboard. The first hoverboard prototype was seen in a kickstarter project of 2013 and was created by Shane Chen, a Seattle engineer. Chen was issued a patent in 2014 for the hoverboard. The company was Inventist, and that original hoverboard is known by the brand name of Hovertrax. Here is a diagram of that original hoverboard. After making a few hoverboards, Chen placed an order with a Chinese manufacturer, and from there it spread like wildfire all across the Chinese electronics manufacturing industry. Now in the Shenzen technology zone itself there are more than a thousand manufacturers making hoverboards. These manufacturers range from small one room units to large organizations like CHIC. Incidentally, CHIC is the same Chinese company that has bought the original patent from Chen and plans to make huge inroads into the hoverboard manufacturing industry. This photograph shows a hoverboard with its cover off. The main components inside the hoverboard are shown with call-outs. This shows you the difference between a good quality circuit board and a low quality one. Usually the blue and green ones are better quality and the bright garish circuit boards are low quality. You can see the battery in the picture below. It has a white label on it, and if you read it carefully, it will give all the specifications and also the brand of the battery. This hoverboard has a Samsung battery. The hoverboards have a lithium-ion battery of around 37 volts. They are big batteries, but just to bring it to scale, a Tesla S vehicle has a lithium-ion battery of 375 volts. This hoverboard has a low quality Chinese battery, and the text on the label is Chinese. This is what a genuine Samsung battery looks like. The motors of the hoverboard are inside the wheels. Here you can see the motor inside the hoverboard wheel. The foot boards control the speed and direction of rotation of the wheels. The main chassis of the hoverboard is formed by two solid metal pieces joined by a rotating shaft. It is the heaviest part of the hoverboard. This video shows a hoverboard being taken apart. This video explains how the foot pads control the speed and direction in which the wheels rotate. Which is the best hoverboard?